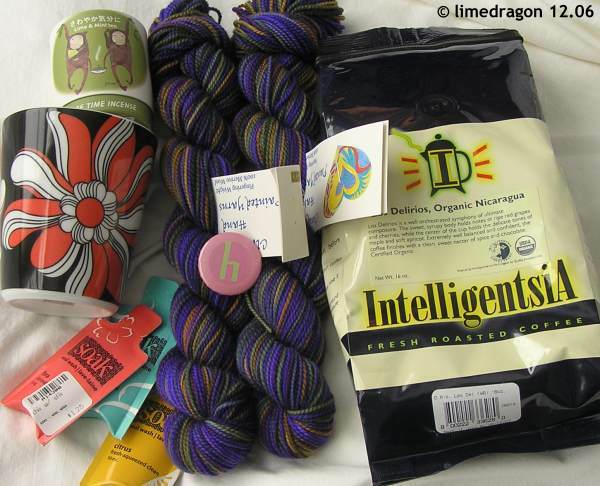 She sent me a bag of organic Nicaraguan coffee from Intelligentsia, it smelled and tasted very good! There’s a cute little purple and green ‘h’ monogram pin and some SOAK samples. I have wanted to try SOAK since I read about it more than a year ago, so I”m glad to have some finally. I love the bold floral graphic and the petite size of the coffee mug Stephanie selected, and she also included some incense by Cafe Time (I keep giggling at these monkey creatures) in two scents, lime and mint tea. The scents are quite lovely and mild, not overwhelming at all. And the yarn? Two luscious skeins of Claudia Hand Painted Yarns in Purple Earth. Wow! I love this colorway (Stephanie noticed it has Viking colors; do you all think the Vikings players should start wearing handknit socks? Their feet would be comfy and they might play better?) The color variegation is marvelous, I Just had to get a close-up. Sadly, somehow I seem to have broken something on my site. Thumbnails and image resziing doesn’t work (should be generated automatically when uploading, etc) anymore. So far I’ve tried the Picasa plugin and the Copperleaf plugin, and no luck. So I’ve had to use plain links from Picasa tonight. I’m a wee bit annoyed at this but already have contacted my site host and will test ZenPhoto tomorrow to see if the same problems occur. I hope it gets sorted out soon! 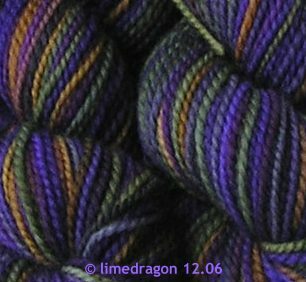 Jeepers – that yarn is a gorgeous color, even if it is Viking purple. I’m so happy you like everything! My husband was born in the Twin Cities and is a die-hard Vikings fan — I think he’d learn to knit if he thought hand knit socks would help his favorite football team! Ooh, what a lovely swap package! I hope you’re enjoying it all. That looks like a great package! What fun. I should take part in the next coffee or tea one!